Chris joined Bell Labs in 1997 after graduating with a Ph.D. in theoretical quantum chemistry from the University of California in Berkeley, California. 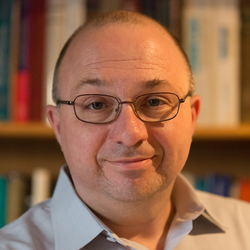 His research interests include the development of computational models and methods for the simulation and control of interesting physical systems. This has included work in areas ranging from linear scaling quantum chemistry simulations, to the design of new optical devices, to the global control of transparent optical mesh networks and to understanding and facilitating the propagation of ideas in organizations. Friedman Award in Applied Mathematics, 1996. Andrew Carnegie Presidential Scholar, 1993. Barry S. Goldwater Fellow, 1993. DOE Honors Research Program, BNL, 1990.